You may have heard from time to time the letters "SEO". Out of pure embarrassment and the need to not ask more about it, you simply nod your head and agree with whoever uttered those damn letters. Don't worry. Many people don't know what it is and how important it is. In fact, my Mother still doesn't get it and when I try to explain it to her, I see her eyes glaze over the more I talk. SEO is Search Engine Optimisation. It's a way of optimising your website so that it gains traction in organic rankings within search engines like Google and Bing. In order to really help you out, we'll have to start at the very beginning. When you do a normal web search for a business or service, chances are you find a number of results. You may see a map image with some businesses listed, too. Let's say you want to find some pizza nearby (because... who doesn't, right?). We can use this as an example to show you what you can find in the search results. As you can see here, there are three types of results in Google when searching for "pizza near me". The very top result is from Domino's and is a paid result. 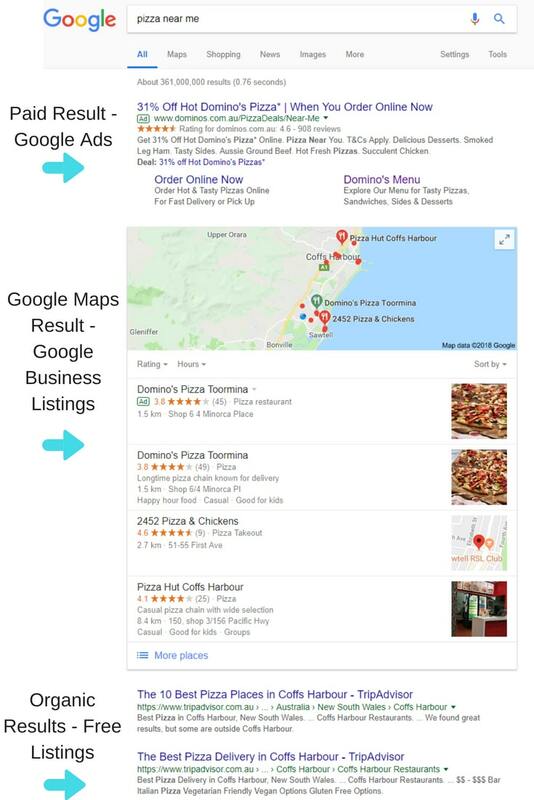 This means Domino's have paid for Google Ads (also known as PPC, or pay-per-click) and because it is quite relevant, it sits at the top of the search results. The next result is Google Maps results. These results are formed from Google Business listings are appear due to the localised search I conducted ie: "...near me". Therefore, Google will look at my location and show me a map of pizza nearby. The third result seen here are your organic results. They appear due to Google's thinking and algorithms and what Google considers to be the best results on the web for what I'm searching for. They are free results, meaning the ones listed haven't been paid for by the website owner, and appear because they are considered to be the most worthy to the searcher. This is where SEO comes into play. How does SEO help organic search results? When you optimise your website for search engines, you're using the knowledge of many SEO's out there and what is considered to be useful to help boost your website to be seen organically in search engines. There are people all across the world who study these algorithms and try to determine what is best practices to be seen in search results. What we're left with are a number of methods that have been determined to be useful to website owners to be able to be seen online, seen by Google and other search engines. 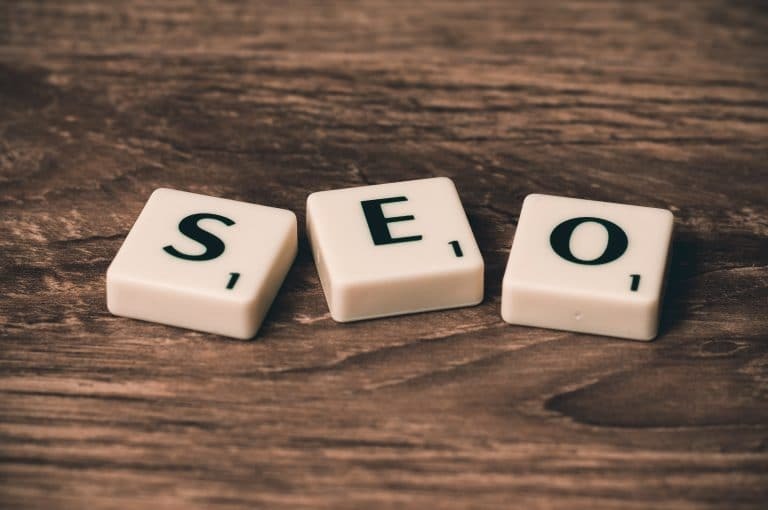 By utilising the knowledge that many SEO's have discovered before us, we can optimise any website to be able to be recognised in search engines. By working on the SEO of your website, you're giving your website the very best chance of being seen organically by potential customers and clients. How do I "do" SEO? While there are some simple things you can get started on, it's important to remember that SEO isn't a "set and forget" kind of project. Because things are always changing at Google HQ, your SEO needs to be worked on continuously. SEO can take time to filter through to search engines with changes sometimes taking months to be picked up by search engines. A change made to your website today (depending on the change) might not be "read" by Google until 4 months time. there are some things you can do to speed up this process, but it's always important to remember that SEO is a long-term project. One of the first things to consider when you want to optimise your website is to start with on-page optimisation. On-page optimisation means you're optimising anything that is on your website (on-page). Anything you do on outside websites (like social media, blog commenting, guest posting etc) is known as "off-page optimisations". By optimising your website, the content and everything that is visible when looking at your site, you'll be able to give your website a steady and firm foundation to help search engines understand what your website is truly about, whether it is relevant to people searching and to help you be found online. How do I start SEO? You have a number of options. You can start by looking through the pages of your website and seeing what content is on each page. Is the content relevant? Does it help explain what your business is about? Does it answer questions? Take a look through your metadata. Your metadata is your meta title (the title of each page) and the meta description (the description that appears in search results under the title). While the meta description doesn't have an impact on search results and optimisations, it's a great opportunity to entice people to click through to your website. If written well, it can help people establish that your website is worth having a look at. Your meta title should include your brand name and at least one keyword. If you're trying to boost local SEO reach, include your town name and state. There are quite a few factors to consider with SEO and is an ongoing project that you may need to dedicate time to. If you don't know where to start or simply don't have the time to be researching the best keywords for your business, that's where a team like Ink Marketing can help. Because it's something we're passionate about, we can look at the best ways to optimise your site (both on-page and off-page) and work with you and your budget to boost your online presence. Feel free to contact us today for a free audit of your website and a friendly discussion about your needs.